We produce, curate and distribute visual documentary and hybrid projects in collaboration with photographers, filmmakers, artists and citizens. Our original productions range from short films and still photography to video and interactive installations, web documentaries and immersive narratives. We help documentarians and artists shape their work for different markets and media platforms. Find some of our featured projects below. 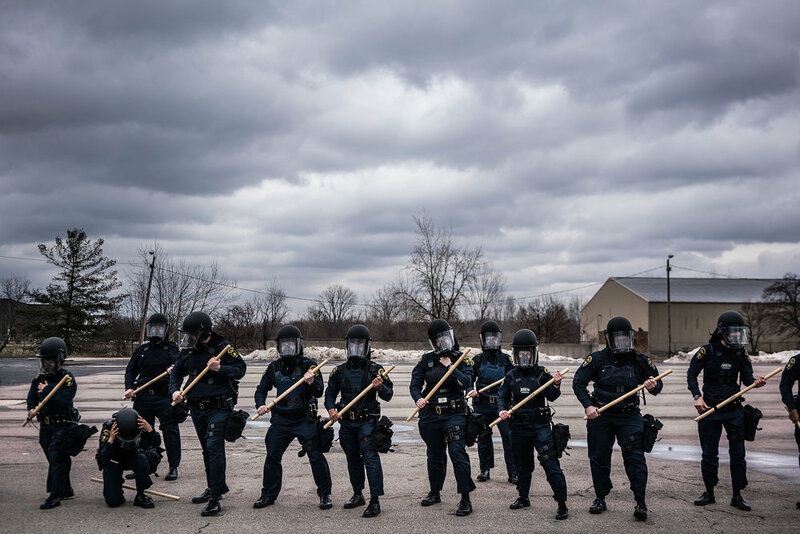 A cross platform episodic documentary series about Flint, Michigan, the project seeks to document a specific moment within this resilient American city in an intimate, character driven way. While it is not aiming to solve Flint’s issues, it will change our understanding of them. The project is using a variety of media - film, photographs, data, VR - and is set to launch in 2017 as an interactive web documentary. Libyan Sugar follows the journeys of Michael Christopher Brown between China, Libya and his home in the US. In Libya he encounters war, injury and death of colleagues. The project includes a short film and a full-scale exhibition that incorporates video and sound installations, prints and artifacts. A portrait of the modern American frontier, set in the borderlands of Texas, Mexico, and the killing fields of Honduras, this project attempts to break down the physical and societal borders we place around ourselves. The narrative follows the reciprocal patterns of violence and poverty and tells the stories of those it displaces. Rather than follow the traditional migrant path, Bracco attempts to answer fundamental questions about why people leave their homes and what happens to those they leave behind. The project brings together documentary photography, video, audio, installation, journalistic essays, dramatic fiction, graphic novel, classroom interaction and material aggregated from social media. This feature documentary follows the journey of Bolivian creative engineer and architect Freddy Mamani. Viewed with scorn by the majority of architects he is seen as a national hero in his hometown in Bolivia. Freddy Mamani is the architect of the New Andean palaces. He represents the growth of the Aymara people to recover their place in society in the fastest growing city in the whole Latin America. A documentary installation project that traces the path of the defunct Karachi Circular Railway in Karachi, Pakistan, through a spatialized archive of video, stills, text, and drone aerial footage. The film takes the viewer on a meditative journey through one of the world’s most complex and conflicted megacities, exploring its urban and human landscape. It is available for display in several formats: as a single channel video, as a nine-channel web-based interactive, and as a multi-screen exhibit. Uncomfortable is a three-chapter transmedia project on eating disorders. The chapters include ‘A Bad Day’, a multimedia interview with Jo, a 21 year old suffering from bulimia, ‘Thinspirations’, a documentation of the Pro-Ana community members promoting anorexia as a lifestyle, appropriating thousands of vernacular self-portraits shared online and The Epilogue, that documents the story of the Robinsons and their daughter Cammy, who died at the age of 26 from bulimia. Streaming Nation is a four-channel video installation in five chapters explores Russia’s contemporary reality, showing a society riven by political conflicts. The official narrative substitutes for the reality experienced by Russians; streaming video returns us to life as seen by citizens. This immersive piece was culled from citizen and news videos uploaded into public domain. It evokes what it feels like to live in Russia today. Streaming Nation premiered at the International Documentary Film Festival’s DocLab in Amsterdam, 2014.